Decorating your web page with colours and borders. The book includes a mixture of activities that you can carry out on the page as well as activities you can carry out on screen. You can take the book with you wherever you go to build your coding skills, and prepare for your time using the computer. The book also comes with a reversible poster and game board, 3D model robots, stickers, and game cards (see below). 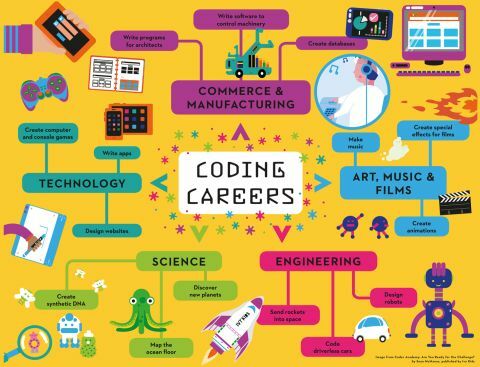 Most of the coding activities are based on Scratch 2.0, a free programming language that is popular with children. It has 18 million users worldwide and is celebrating its tenth anniversary in 2017. Coder Academy book joins the Academy series from Ivy Kids, which also includes Astronaut Academy and Engineer Academy. 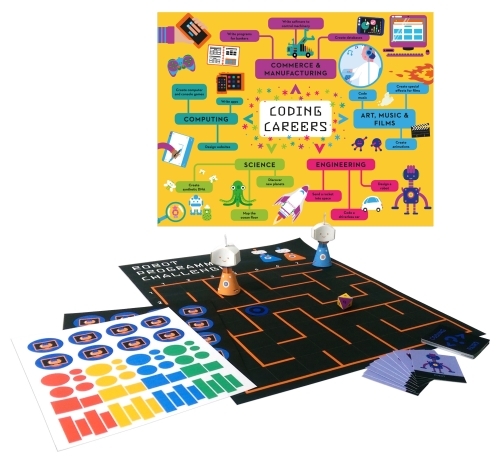 Coder Academy comes with a poster, Robot Programming Challenge game (the maze is printed on the reverse of the poster), two 3D model robots, a Coding Pairs card game, and stickers to use to design sprites and track your progress through the book's activities. 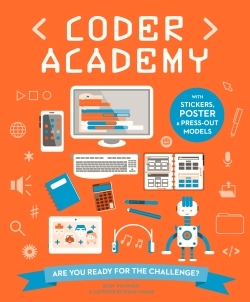 Take a look at Coder Academy with this free PDF sampler. 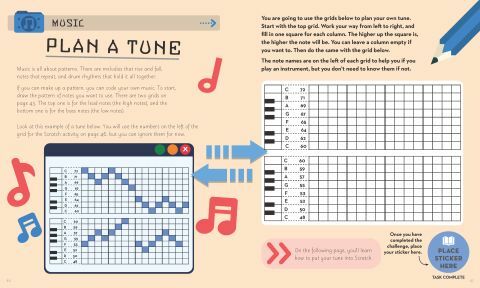 It includes the chapter on music, showing you how you can use Scratch to compose music and design your own instrument. It also includes the table of contents and introductory pages, so you can get an overview of the book. 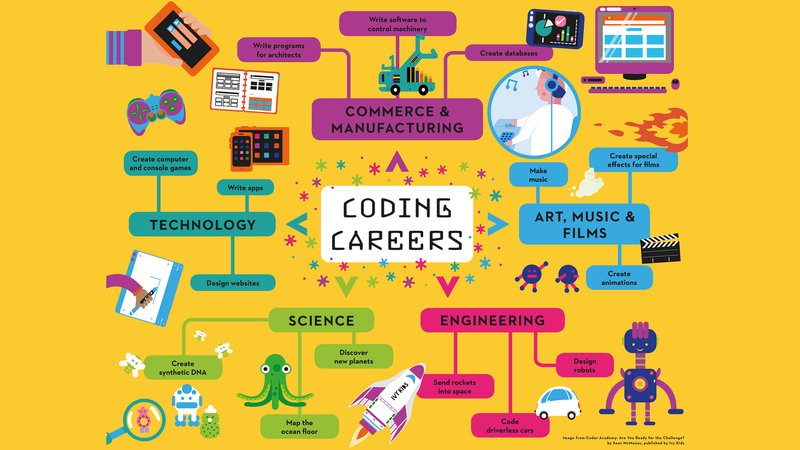 Coder Academy includes beautiful illustrations by Rosan Magar, and we thought some of them would make great sprites for you to use in your Scratch games. Download the sprite pack here. You can also find this free sprite pack on the Scratch website. Decorate your desktop with the Coder Academy wallpaper, based on the poster that comes with the print edition of the book. 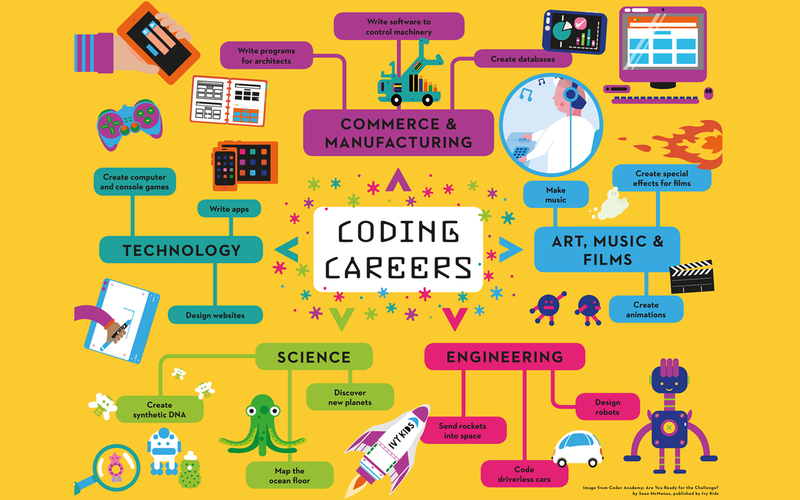 It shows careers that use coding, including technology; art, films and music; engineering; and science. The wallpaper is available in three sizes: 1280 x 800, 1366 x 768, and 1920 x 1080. Click the link that's the best match for your desktop to open the image in your browser. Right-click the image and use the menu that opens to save the image to your desktop. Go to your desktop, and then right click the file you downloaded and use the menu to set it as your desktop background. In your browser, click the back button to get back here again! The Scratch code is on the Scratch website in the Coder Academy studio here. You can choose an example and then click See Inside to see the code. You can change the code to make your own remix of the program. Scratch 2.0 also now works on the Raspberry Pi 3, so you can make the Coder Academy programs on the Raspberry Pi . You can download the HTML template to make your own web page too. Click this link to view the template in your browser. Right-click this link to open the menu. In Chrome, choose the option that says Save Link As. In Internet Explorer choose the option that says Save Target As. In other browsers, choose the option to save the file to your computer. Save it to your Desktop or Documents folder. If you want to make a website on the Raspberry Pi, use the Leafpad Text Editor. You'll find it in the Accessories section of the Programs Menu. Check that your website content does not include any personal information. Find a hosting company. The hosting company stores your website on its server (or computer) and makes it available to everyone over the Internet. Ask a friend for recommendations if you know friends with websites. The hosting company will rent you space to store your website, and also give you a chance to buy a domain name, which is the website address. My domain name is www.sean.co.uk. You will need to renew your domain name periodically, or someone else can buy it and use it. The hosting company can provide instructions for uploading your website to their server. They will give you a username and a password and you will usually use FTP software or Windows Explorer to upload your content. (You can just type the FTP address your hosting company gives you into the path bar at the top of a Windows Explorer window, and then drag and drop your files as if you were copying between folders on your computer - see picture below). It might take some time for your domain name to become available at first. Your hosting company's tech support should be able to help with any problems if you can't get it working.